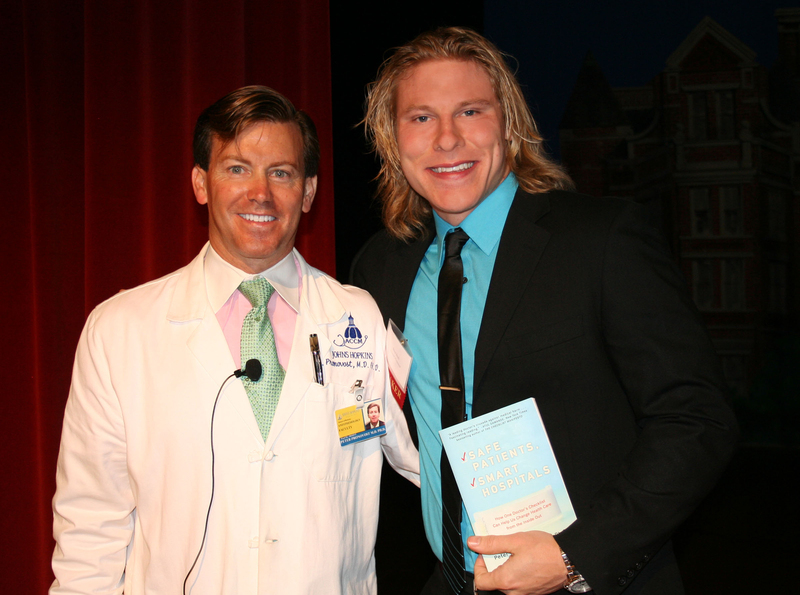 As a health care advocate, I have traveled the country and spoken at annual meetings for many state hospital associations, at dozens of health care leadership conferences and several annual conventions and medical symposiums. During my travels, I have collaborated with several world-renowned health care institutions on large scale projects related to patient and family engagement in the hospital setting. One project in particular that I really enjoyed working on was "Project Emerge" with the Armstrong Institute for Patient Safety and Quality at Johns Hopkins. After I was invited by Dr. Peter Pronovost, Director of the Armstrong Institute, to give the keynote presentation at the 2012 Johns Hopkins Patient Safety Summit, he requested that I also serve as a volunteer patient advocate to work with him and his team. As a Hopkins graduate student, it meant a lot to me that I would get the chance to work with Dr. Pronovost because he is a role model of mine who has devoted his career to finding ways to make hospitals and health care safer for patients -- a personal mission that I have also been on since I left the hospital in 2004. He is internationally recognized for his work in patient safety and in 2008 he was awarded a MacArthur Fellowship, or "genius grant." That same year, Dr. Pronovost was named one of Time magazine's "100 Most Influential People in the World" for his work in patient safety. To me, he is a "Hero of Humanity." One of Dr. Pronovost's major accomplishments in his medical career is his method for reducing the infections associated with central line catheters. His checklist for care providers (doctors and nurses) virtually eliminated these infections and has saved more than 1,500 lives and $100 million annually across the State of Michigan. Dr. Pronovost's checklist protocol is now being implemented in hospitals across the United States and in several other countries across the world. With my background as a former ICU patient, I have seen how important modern medicine and technology is and that is why I really enjoyed having the opportunity to be a part of 'Project Emerge', which consisted of a technologically innovative electronic tablet that improves communication between the patient, family, and care team in the hospital setting. With this tablet, the family members can gain a better understanding of the type of treatment that their loved one is getting. The care providers can also gain a better understanding of the patient beyond their health status, but also their identity and individuality. The tablet is programmed to present individual treatments, the device visually shows when a patient should receive particular therapies and whether they have been delivered. The tablet coordinates all the incoming data from the patient's monitoring equipment, and it reminds staff members when to do certain tasks as well as alerting them to situations when their patients may be at risk. Back in 2004, my care providers explained to me that they were able to save my life because they had the latest state-of-the-art technology at that point in time. If it were ten years earlier, they told me that things could have been a lot different. 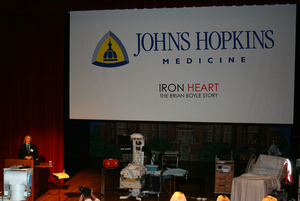 I would reflect on this memory every time I would travel to Baltimore to work alongside several innovative members of Johns Hopkins Medicine, the Armstrong Institute, the Johns Hopkins Applied Physics Lab, the Whiting School of Engineering's Systems Institute, and the Berman Institute of Bioethics. A chill ran down my spine every time I walked into one of these meetings because I knew I was a part of something that would further advance medical technology. Future patients who would be experiencing what I went through in 2004 would benefit from this device, and it meant a lot to me that Dr. Pronovost chose me to be a part of this multidisciplinary team that would help improve the experience of the patient and their family during their time in the hospital. From the East Coast to the West Coast, from my hospital all the way to the White House in our nation's capital, I have spoken on behalf of patients and served as a living example of the extraordinary work that care providers do every day. It is an honor to speak in behalf of health care as a former patient, but my goal is to make even more of an impact by also becoming a health care professional. I am currently in the dual degree program at Johns Hopkins University where I'm earning my Master of Communication (concentration in Health Communication) and an MBA with a concentration in Healthcare Management. My journey has truly come full circle over the years, and my mission to make an impact with my background is only just beginning.